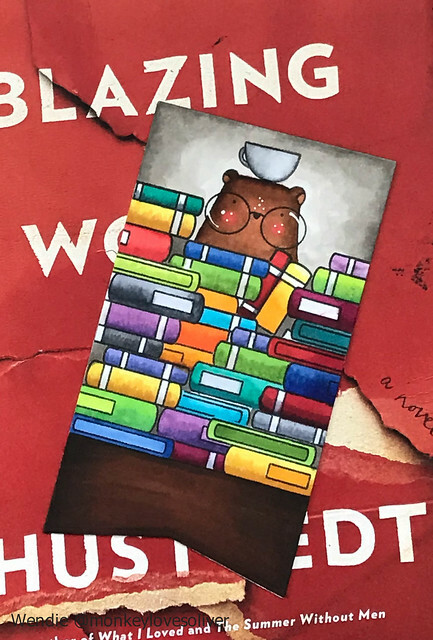 I have to apologize in advance because I’ve had a lot (alot) of caffeine today and I’m a little wired and chatty and, you guys, I am SO tickled with how these bookmarks turned out. 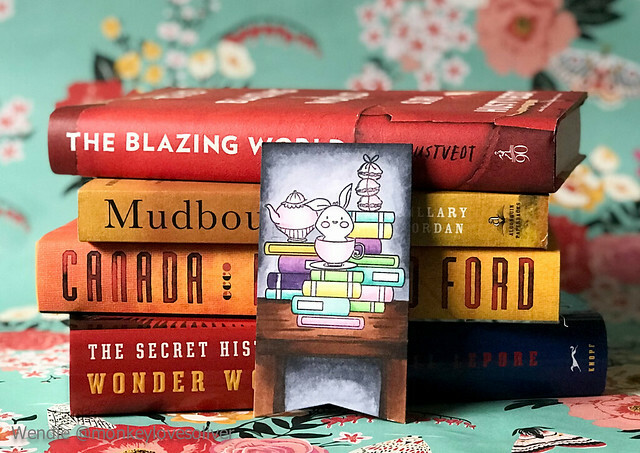 If you follow me on Instagram, you’ve probably seen my in-progress pics, and I can’t believe it’s taken me this long to share the finished bookmarks with you. Breathe. Ok, let me back up. I’m in a bookclub at work (I work with some librarians and other information professionals, of course I’m in a bookclub). 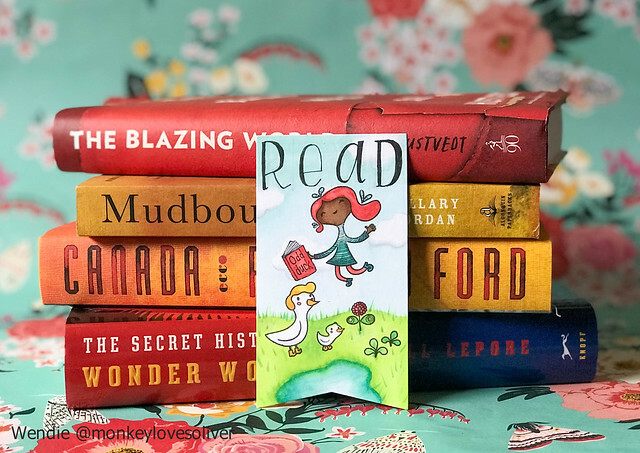 We’re really just getting started so I thought I’d make some bookmarks for my fellow readers. 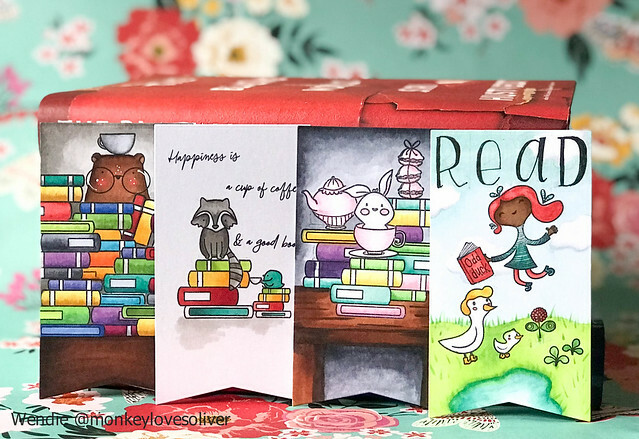 My grand idea evolved from finally using the Books & Coffee stamp set from Waffle Flower to making a series inspired by the Read @ Your Library posters. I’m going to start with my favorite of the bunch. I was inspired the David Bowie Read poster – the one with him in a letter jacket, mid-air? Arguably the best Read poster. I don’t know how the ALA scored that one, but I’m glad they did. Instead of David Bowie, I used the Hooray stamp set from Waffle Flower. I adore this set and I thought the jumping girl was perfect for the scene I had in my head. I started off by stamping the book (from a different Waffle Flower set, book title by yours truly) and masking it, and then stamping her along with the ducks and plant life. I colored the whole scene with Copic markers, sketching in a little pond, grass, and clouds. Would it be completely selfish if I kept this bookmark for myself? I love it so much. Once I was done coloring I inked in the Read with an illustrator pen. Pro tip: Don’t sketch with pencil and then color over it with Copic. I could not get those faint pencil lines erased. Rookie mistake. Also, can we talk about that duck’s pompadour and boots? He is one cool duck. My second favorite bookmark of the bunch is the first one I made, using the Books & Coffee set. 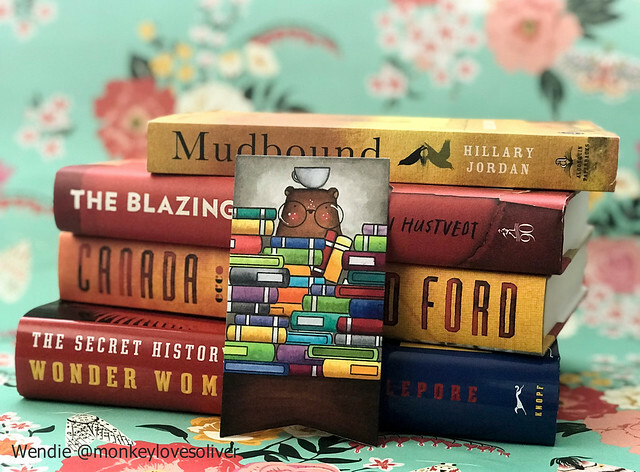 I love this bear in his big glasses peeking over the stacks of books. I wish I was that bear. This bookmark took a lot of masking. I stamped a few stacks of books on masking paper and then started stacking books on the cardstock. Then I stamped the bear and a cup of coffee on his head. I again colored the whole scene with Copic markers and colored in a table top for the books to sit upon. I used a white gel pen to add some shine and freckles to the bear. 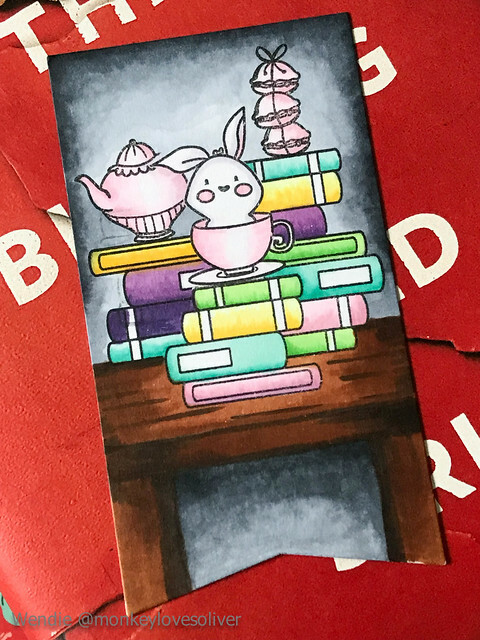 For this bookmark, I used the books from Books & Coffee and tea pot, macarons, and bunny in a cup from Tea for Two. I chose a more pastel color scheme for this bookish tea party, using, you guessed it, Copic markers. I added a table (need to work on my perspective). You can tell where I dropped an inked up stamp on the paper despite my best efforts to color over it. 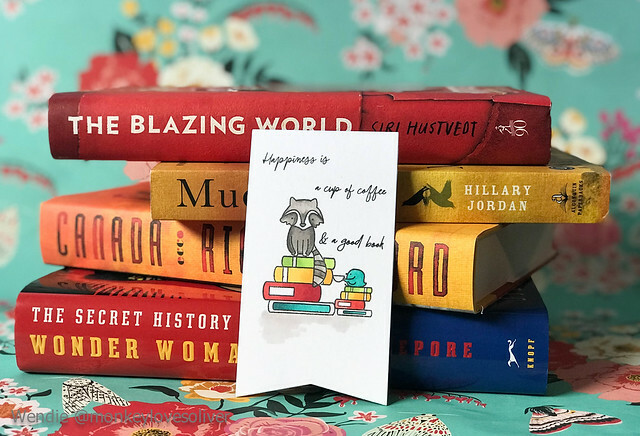 For the last bookmark, I kept it really simple and just stamped a raccoon sitting on top of a stack of books. I decided to give the raccoon a little bird friend, because everyone needs a little bird friend, right? I decided to make their books match. I left a lot of white space on this one because I wasn’t really sure how to complete the scene. 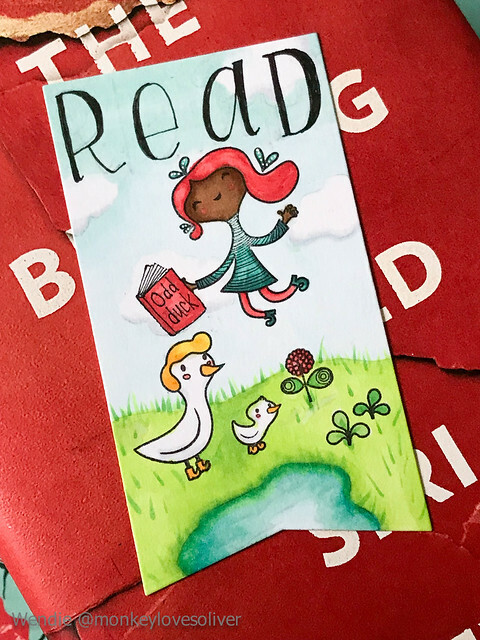 I think I’m going to play with the Read theme a bit more for the next batch of bookmarks. What scenes should I make or themes should I play with? I need ideas!